Which ship did this chair come from? In 1988, while on honeymoon, I visited an antique shop in Auckland and came across this ship's chair. Nothing was known about the history but the back had the letters T S N Co in a carving on the centre splat. I bought the chair and it has been a prized possession in my home since then. I have always wondered about its history. In particular, which ship did it come from? Since creating this webpage I have been contacted by Vanessa who has her own similar chair. 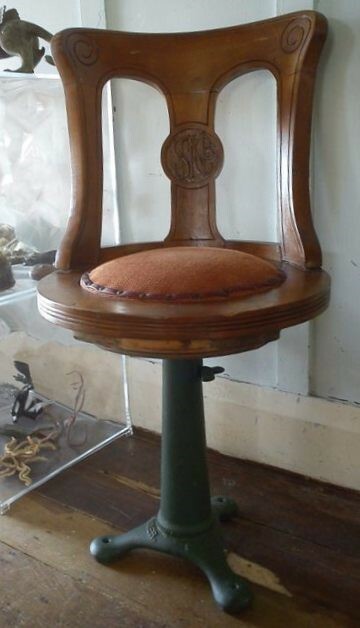 To read more about this chair, go to the bottom of the page. Now there are two of us seeking to solve the mystery of the chair. 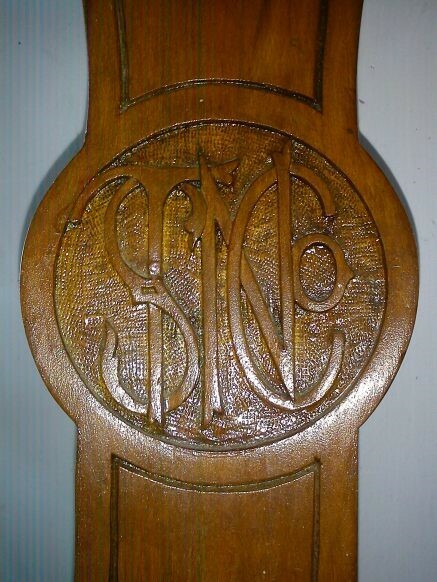 The photo left shows the fine carving of the letters on the centre splat in the back of the chair. The letters stand for the Tasmanian Steam Navigation Company. 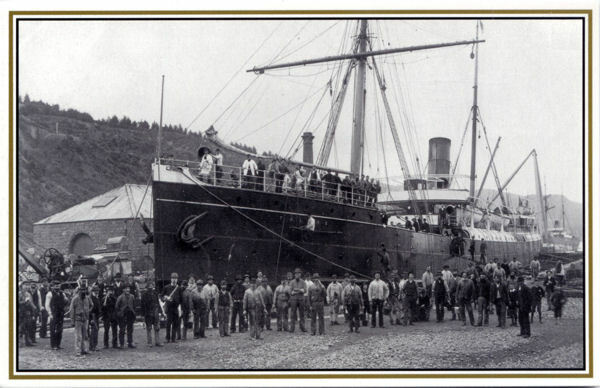 The Tasmanian Steam Navigation Company Limited was formed in Hobart, Tasmania in 1853 to operate a shipping service from Tasmania to the Australian mainland. The company expanded its routes into New Zealand in 1864. In 1865 the Tasmanian Steam Navigation Co took over the Launceston & Melbourne Steam Navigation Co after the latter lost the ss City of Launceston. Over the years I have been looking for clues to ascertain the ship from which the chair came. 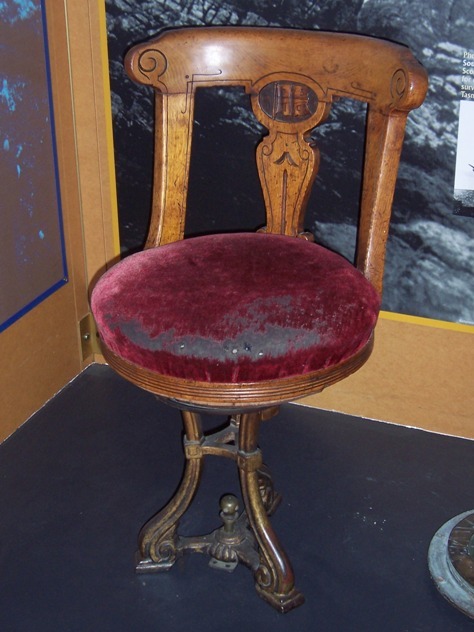 There is a chair from another unidentified TSNCo ship in the Tasmanian Maritime Museum at Hobart. The photograph below shows that the chair is quite different in style and detail to my mystery chair. The artwork used to present the company initials is very different. This chair suggests that the decor of each ship in the company was probably unique and reflected styles in vogue at the time of construction. The style of my chair compared to the Tasmanian Museum's TSNCo chair looks later. Pateena, Oonah and Talune were the last three large steamships built for the company in 1883, 1887 and 1890 respectively. A newspaper report describing the interior fittings of Talune seems to provide a promising lead. 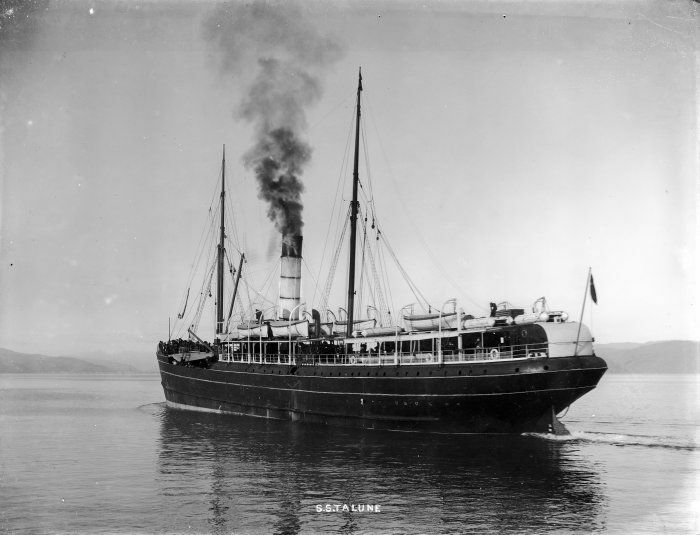 Talune was the last ship built for the Tasmanian Steam Navigation Co before it was taken over by Union Steamship Co. The record for the Talune from the Register of Australian and New Zealand Ships and Boats is given below. Fate/Status— Year: 1925 Type: B/U Details: B/U Auckland,NZ.Hulk scuttled 1925/11 to form breakwater at Waikokopu. History and details: Teak decks. 13 knots during trials. Last vessel built for TSNCo. 2000t cargo dwt. Luxurious accommodation, 120 first class and 60 second class passengers, special care taken with ventilation, special fans driven by a compound engine. Poop fittd with a spacious social hall with elegant marquetry work on the panels, upholstery of green and gold pattern, one end of the hall has a book case, the front having engraved the names of Scott, Shakespeare, Moore, Burns, Goldsmith & Byron, electric bells at hand at various locations in the hall, piano at the opposite end with marquetry work and heads of Mozart and Beethoven in the piano case. Saloon in the poop immediately beneath the social hall, on each side of which are fitted large and airy state rooms, having enamelled iron beds, tip-up wash basins, Axminster carpets, neatly-jalouised side frames in solid oak, maple and other light woods, all highly polished, form the sides of the saloon. Up the middle of cabin are two dining-tables having revolving chairs in sycamore, highly polished, and upholstered in Utrecht velvet. The officers' quarters, the smoking, cook, and store rooms are situated under the bridge, and in the forecastle is accommodation for second-class passengers. The crew's quarters are tween decks forward and have a separate entrance. Two Weir's patent boiler feed pumps, one general service pump. Brown's reversible starting gear. Murdoch's governor. Donkey boiler 100lb for the cargo appliances. Five steam winches, five Lynn's steam whips for discharging coal or light cargo. Steam windlass. Muir & Caldwell's steam steering gear with all the latest improvements, used silent shafting instead of noisy chain-work. Engine columns also serve as oil tanks. Steam turning engine for when under repairs. Westinghouse generator for electric lighting, 200 lamps of the most approved kind. Ventilating engines by Paul's. Engines for sentinal ash lifts by Alley & McClellan. 1890/04/19 launched, christened by Miss Simpson of Elmhurst. Name aboriginal word for "Mount Royal". Built for the Hobart-Sydney run, specially adapted for the carriage of fruit. 1890/06 completed. 1890/07/03 departed Leith Roads for Australia. 1890/08/20 arrived at Hobart from Leith, 47 days 10 hours. Hobart No.9 of 1890. 1891 TSSCo sold out to competitor USSCo. Transferred to Melbourne-New Zealand service after first year. 1894 carried yacht Gloriana (qv) from Auckland to Wellington for Anniversary Regatta. 1899/06/c19 towed disabled ss Perth (adrift for 56 days) into Sydney, captain's hobby was the study of Tasman Sea tides &currents, predicted location of Perthshire within a few miles. Bass Strait service. 1901/03-07 reported that woman charged with murder causing death of man on board ss Talune by administering poison, jury unable to agree after repeated trials. 1901 operating in horseshoe run, Sydney-Cook Strait-New Zealand-Bluff-Hobart-Melbourne trade. 1904/07/05 collided with ss Admiral (qv) at Wellington. 2087g/1370n 259nhp T.3Cy.23", 37" &61" by 1910. Tranferred to South Sea Islands service. 1918/06/22 departed Suva for Auckland with a number of passengers and a large quantity of fruit and other Island produce. 1918/11/04 arrived at Apia, Western Samoa, became notorious as the ship that carried Spanish influenza to Upolu and Saval'l which wiped out 8500 people or 22% of their population. 1920/05/15 reported came across abandoned schooner Retriever (qv) between Raiatea and Papeete, Retriever floating on cargo of timber, seven men boarded the derelict, Retriever taken in tow by Talune, towline broke in heavy weather leaving Retriever adrift for some time, new tow-line eventually secured, Retriever towed to Papeete waterlogged and with only her foremast standing. Laid up at Gisborne for several years before being broken up. 1925/11/21-11/25 hulk of Talune towed 375 miles from Auckland to Waikokopu by ss Hinemoa (qv), 7 crew on hulk attended to the steering and general seagoing of the old ship, carried 600 tons cement, average speed 4½ knots, hulk to be filled with boulders & concrete in preparation for scuttling. 1926/02/15 reported that the Auckland merchants used to do a fair amount of trade in bananas with the Cook Islands using the Talune, which was the most suitable and fastenst boat that they had ever had on the run; but that trade had been now lost to Auckland. 1926/02/16 reported had been sunk to form part of the breakwater for the wharf at Waikokopu, new harbour to serve as an outlet for the Wairoa District, Hawkes Bay. 2002 New Zealand Prime Minister Helen Clark made an official apology to the Samoan people for the actions of the NZ authorities in spreading the Spanish flu. Research notes: Ras1^1899/6/23,1901/3/15,1901/3/22,1901/3/29,1901/5/3,1901/6/21,1901/7/5. Msi1 sys scuttled 1926/01/22(check). Mer1^1890/8/21 says 1992g (check). 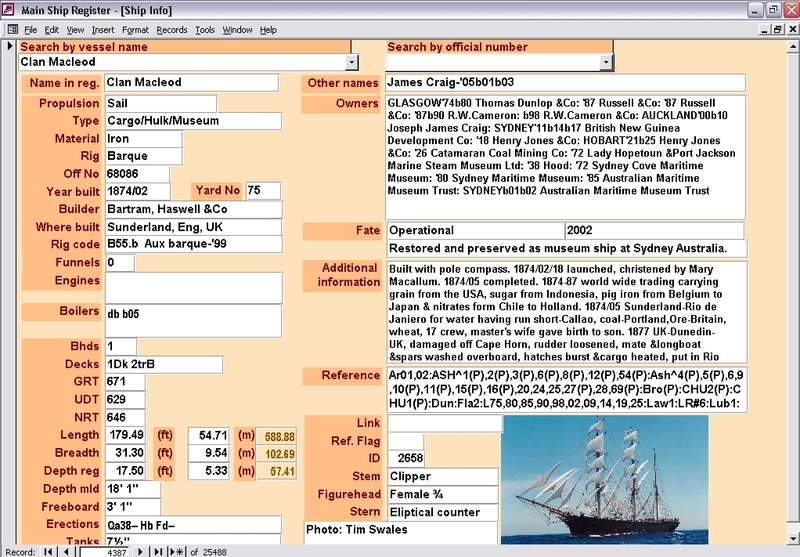 If information is published please acknowledge Mori Flapan: Register of Australian and New Zealand Ships and Boats 2015 and any other major contributors listed in References above (usually denoted by capitals). The records indicate that the Talune was broken up at Auckland in 1925. 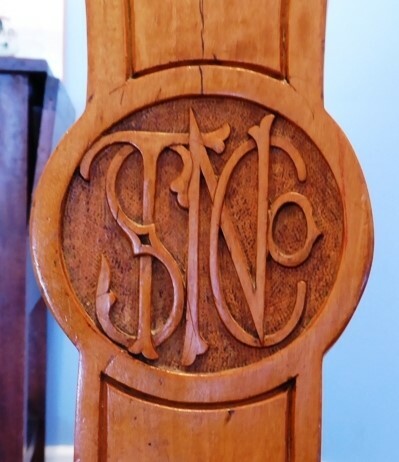 The fact that the mystery chair was purchased in Auckland in 1988 is not a conclusive connection but it is at least consistent. However, other TSN Co ships were broken up in New Zealand, and chairs are reasonably portable, so not too much should be read into the Auckland location. More persuasive, however, is the detailed description of the Talune's accommodation contained in 1890 newspapers. For example, see the Sydney Morning Herald article p.8 of 6 September 1890 below. 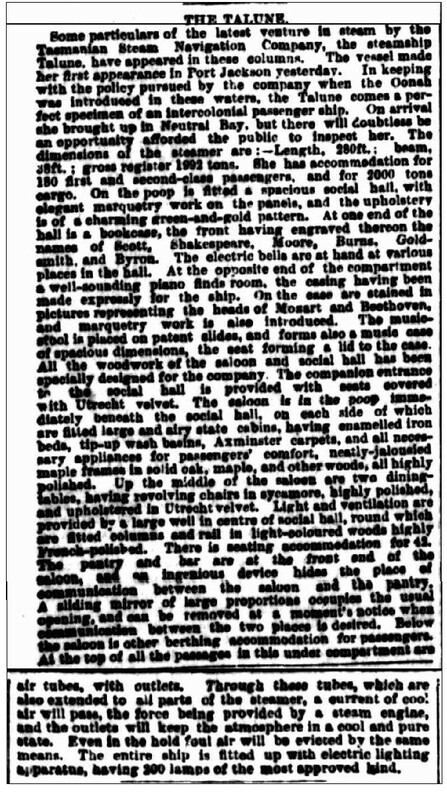 "The saloon is in the poop immediately beneath the social hall, on each side of which are filled large and airy state cabins, having enameled iron beds, tip-up wash basins, Axminster carpets, and all necessary appliances for passengers' comfort, neatly-jalousied maple frames in solid oak, maple, and other woods, all highly polished. Up the middle of the saloon are two dining tables, having revolving chairs in sycamore, highly polished, and upholstered in Utrecht velvet. Light and ventilation are provided hy a large well In centre of social hall, round which are fitted columns and rail in light-coloured woods highly French-polished. There is seating accommodation for 42. The pantry and bar are at the front end of the saloon, and an ingenious device hides the place of communication between the saloon and the pantry. A sliding mirror of large proportions occupies the usual opening, and can be removed at a moment's notice when communication between the two places la desired." Could the mystery chair be one of the 42 saloon chairs mentioned? The timber used in the chair is quite light in colour and might perhaps be sycamore. Sycamore is a timber that I am not familiar with so any thoughts on this would be much appreciated. 2. 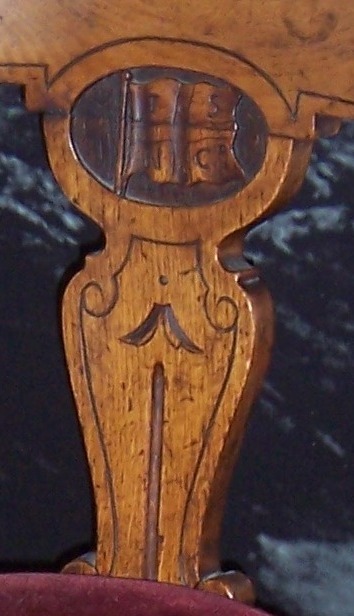 Another identical chair that has provenance establishing that it came from the Talune. If you can help with either a photo of the saloon of Talune or the whereabouts of another saloon chair from Talune, please contact Mori Flapan by email. Any other leads or suggestions that would solve the mystery would also be gratefully received. 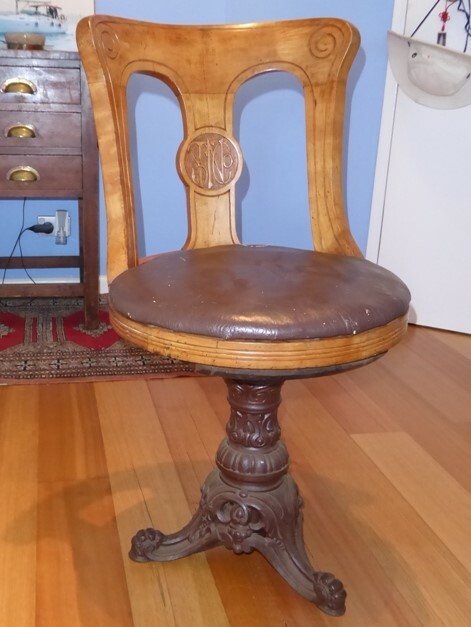 Another Tasmanian Steam Navigation Co chair has been located! Hi. I was just googling to see if I could find out a bit more about an antique ships chair I own, when I came upon infomation you had posted about your ships chair. My ships chair is identical to yours in the woodwork, but mine has a checked velvet upholstery & is missing the original base [It's on a singer stool base]. It has the same TSN logo. The chips show a very light wood under the varnish.... I bought mine a few years ago from a Webbs auction in Auckland. Hi Mori. Here's some photos of my chair. 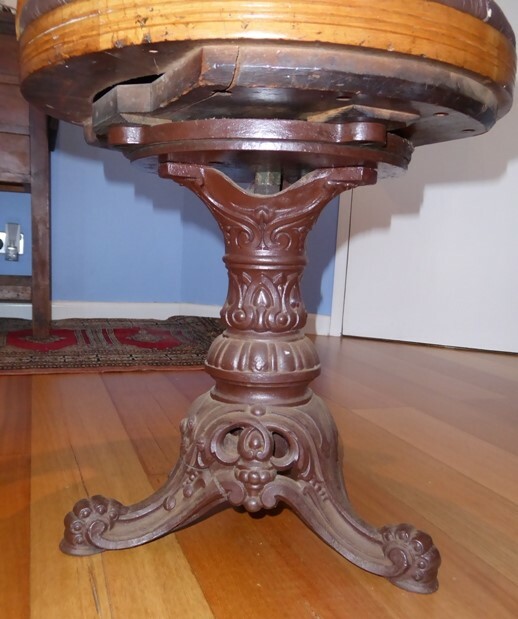 [see below] It's not in the best condition, thanks to Mainfreight being rough with it in transit from Auckland. Is it the same shade as your chair? The size of the cushion has got to be original, given depth of the wood frame...the velvet, leather edging & tacks could possibly be the original & 130 years old. Dear Vanessa, thank you very much for the messages and the photos. Your chair certainly looks like it was originally identical to mine. It has a similar rich tone to the timber. The upholstery appears more authentic than that on my chair. 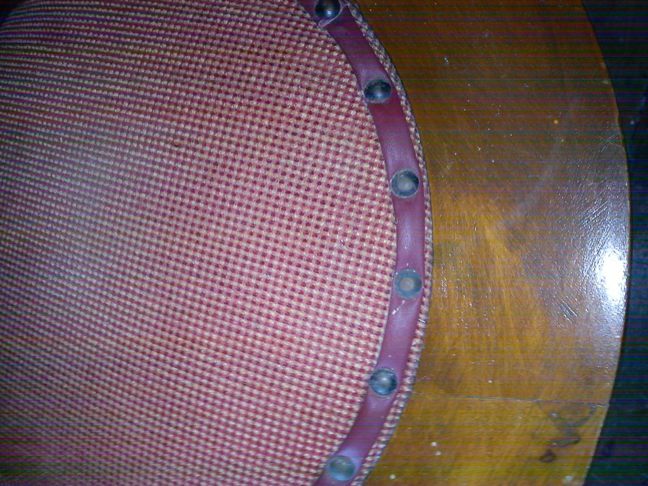 It is possible that it is original, though I think 130 years is a very long time for a seat cushion to be in such reasonable condition. My guess is that it was probably replaced at one time, but using materials and techniques similar to the original upholstery.